If you’re planning on changing the engine oil on your pride and joy over the weekend, then make the job easier on yourself by picking up one of these Oil Drain Kits from Laser Tools (part number 6087) when you buy your engine oil. 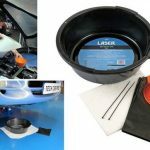 The kit includes a generous 6-litre capacity oil drain pan made from tough polypropylene that can be used again and again. 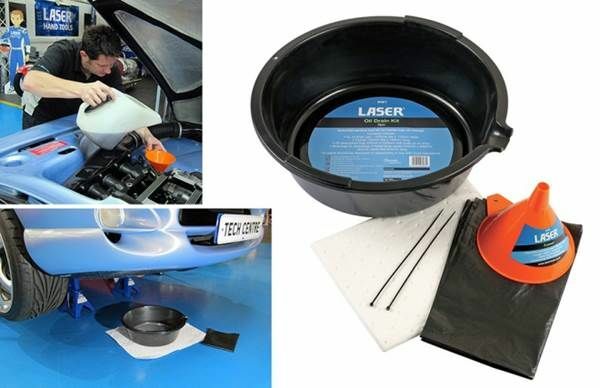 Also included is a generously sized oil absorbing mat (500mm x 400mm) that will absorb oil, brake fluid and other petroleum-based fluids but repels water-based fluids and keeps the garage floor (or driveway!) tidy, plus a hazardous waste bag and cable ties to dispose of the mat when you’re finished. The 140mm diameter funnel included in the kit is essential to make sure you don’t spill oil on your clean engine. Everything you need for a fuss-free oil change and very good value at just £14.90 inc VAT and available from your local Laser Tools stockist. Look out for special offer prices too. Print article This entry was posted by admin on October 14, 2016 at 9:06 am, and is filed under Steve Says. Follow any responses to this post through RSS 2.0. Both comments and pings are currently closed.